I know this is supposed to be a Hot Dog Story, but I am going to digress this time. Mrs. Hotdogman and I were strolling down West Grand Avenue in Old Orchard Beach, Maine in search of nourishment when we happened upon Big Bellies Deli. 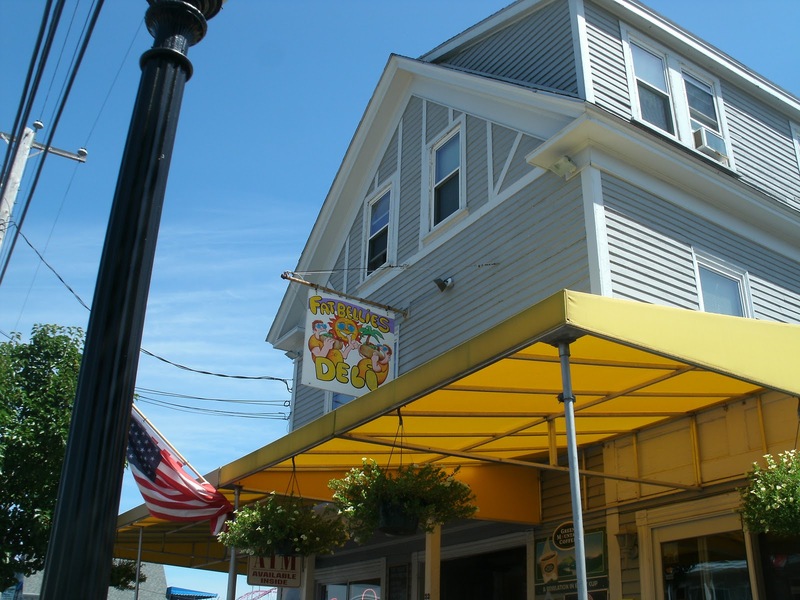 What caught Mrs. Hotdogman‘s eye wasn’t the snazzy hand painted sign or the bright yellow awning…. 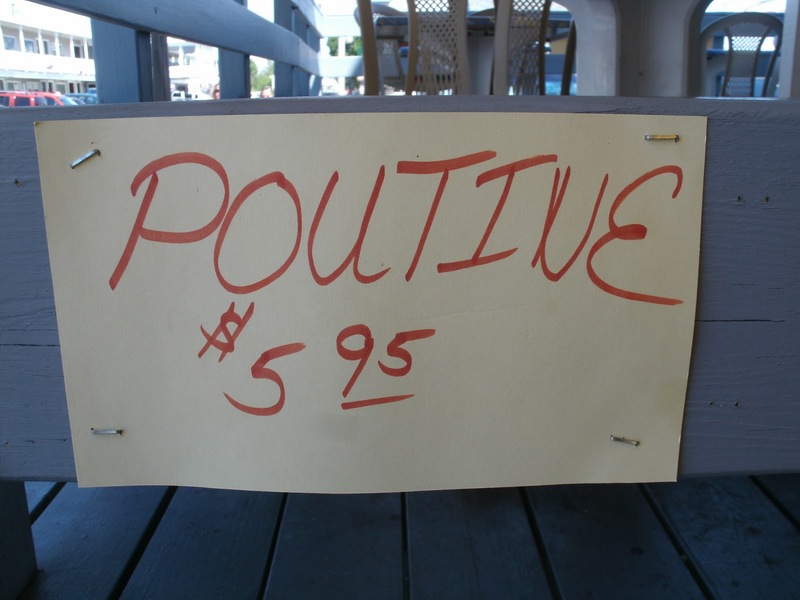 …it was this little hand lettered sign, stapled to the outdoor deck of the place. Poutine, for the uninitiated and non Canadian, is a decadent delicacy most often found in restaurants in our neighbor to the north (Canadians like hot dogs too). Unfortunately, poutine is uncommon in the USA-too bad, they’re DELISH. Once my Canadian cutie spied this sign, there was no doubt what was going into our guts in the next few minutes. 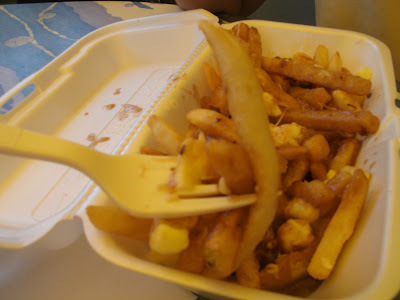 For those of you who don’t know, poutine is french fries topped with cheese curd and beef gravy. The cheese melts onto the fries and gets mixed in with the gravy and it makes for quite a snack- even a small meal. 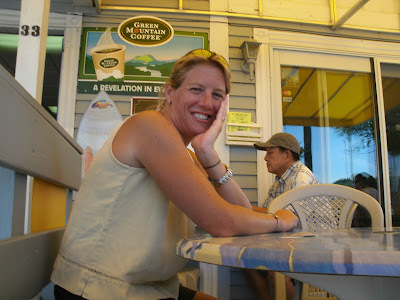 Poutine is by far Mrs. Hotdogman‘s favorite food. I like it too. Hello from the UK! Great website by the way. 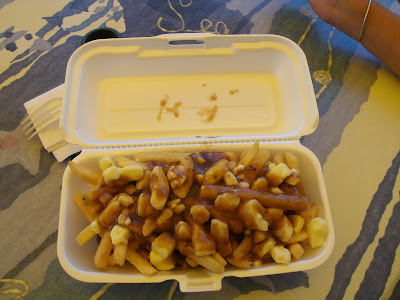 When I saw the photo of “poutine” I thought it was a photo of a dish we have over here simply known as Chips and Gravy (normally minus the cheese). It used to be the staple diet of every teenager in the country. I know our national dish is supposed to be Fish and Chips but most fish in Chip Shops (“Chippies”) is small and frozen not to say very expensive too. Hot Dogs over here are pathetic. I weighed one of the tinned ones and it was 20g (about two thirds of an ounce). There definately is a market over here for large authentic american dogs.